A piece that can move either as knight or rook is known as an Empress, and a combination of knight and wazir (i.e. single-step rook) is an Emperor. Tours by either of these pieces, i.e. using both knight and rook moves, can thus be termed Imperial. A class of imperial tours that has received intensive study on the 8×8 board are those that use only a small number of rook moves, connected by chains of knight moves all of the same number of moves. In particular magic tours are easily constructed with two or four rook moves, all the others being knight moves. These are also known, perhaps misleadingly, as Two-Knight Tours and Four-Knight Tours. Some results of this type were collected by H. J. R. Murray and are included in his manuscripts (1942 chapter XIV) and (1951 chapter X). He wrote that: "The problem was popular with French composers between 1880 and 1914 when nearly 300 two-chain magic tours were published in the Paris chess columns." It seems he was unaware of earlier work by "E.H." published in the Glasgow Weekly Herald from 1873 onwards. I was able to consult the 1873-4 volume at the British Library Newspaper depository at Colindale on 25 October 1996 and include some results of this, but further work needs to be done in checking these sources. It is of course possible to construct Two-Knight and Four-Knight tours that are not imperial tours, since moves other than rook moves may connect the ends of the knight paths. The connecting moves can, indeed, themselves be knight moves: this is the case in two of the magic tours by Jaenisch, which he described as 'doubly reentrant' since 1 linked with 32 as well as 64, and 33 linked with 64 as well as 32. Alternating wazir and knight tours interested Indian composers. Here is an example from Harikrishna 1871, two from Naidu 1922 and a symmetric tour of my own (Jelliss 1984). In my response I wrote with an account of other alternating tours dating back to As-Suli (see the pages on King and Multileaper Tours). I was unable to find out any more about J. Wallis. but noted that by simple transformations Wallis's tour can be converted into other alternating tours similarly magic, including this Empress tour, formed by interchanging the 2-3 and 6-7 ranks and files. (For the other two see the section on Queen tours). Some moves have to be shown by curved lines for clarity. Since the moves of the emperor always take it to a cell of opposite colour to that on which it stands, the results of the theorems, regarding magic knight tours on even sided boards apply to it. The question of the possibility or not of magic knight's tours on rectangles 4m by 4n + 2, led me to consider emperor tours on such boards. As expected, they are possible. Examples follow. They were first published in The Games and Puzzles Journal #26 March-April 2003. The following two are the only two-knight emperor magic tours on the 4×6 board. The magic constants are 50 and 75. These tours can be renumbered cyclically from the half-way point (i.e. 12-13 becomes 24-1 and vice versa) and remain magic but are then empress tours since the 12-13 rook-move link is a three-cell move. Here are examples 8 by 6. The first was consciously constructed using contiguous contraparallel chains, but the others were constructed for their visual symmetry. In the first tour if the ranks are divided into three pairs then all these pairs add to 49 (rank total therefore 3×49 = 147. In the files pairs related by reflection in the horizontal median add to 25 or 73 which together equal 98 (twice 49) thus ensuring the file sum is 4×49 = 196. This is the same in the second tour, but in the third tour the constants in the files are 37 and 61. The same plan as in the first 8×6 tour above can be extended to any boards 8×2n (with n >2). See section 6 below for an 8×8 example. Here is an 8×10 example: the horizontal pairs all add to 81 and the vertical pairs add to 41 and 121 giving the magic constants: row sum R = 5×81 = 405 and file sum S = 4×81 = 324. The results in this section and the next are from the H. J. R. Murray manuscripts and the "E.H." articles on "Knightly Peripatetics" in the Glasgow Weekly Herald mentioned in the Introduction. The totals for numbers of tours given by Murray differ in the two versions. The number of 32-pt chains connecting f7 and c2 as counted by de Hijo is 378, but not all of these give magic tours. Murray mentions totals of around 290 geometrical tours in direct quaternary symmetry based on the work of Ligondes. He expresses the view that, apart from the diagonally magic tours shown in the next section, the two-chain tours which are magic are not particularly interesting. We begin with six examples from Murray's two manuscripts; comments in quotes are his. 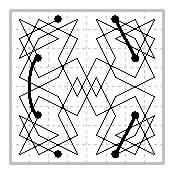 The first example derives from Vandermonde's method of constructing two-knights' tours, which "serves with little modification for the construction of two-chain magic tours on the chessboard. 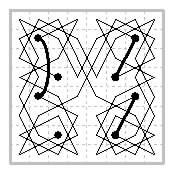 Indeed, if Vandermonde had used an arithmetical notation instead of a geometrical diagram, and had happened to adopt the right cell for his starting point, his two-knights' tour would have been magic." (The diagonals add to 248 and 272). The second diagram shows a solution with the linkage cells all in the central 2×4 area (diagonal sums 240, 280). "It is clear that this method of construction entails certain numerical properties. (1) Diametrally opposite cells differ by 16. (2) If m, a number not greater than 16, stands on cell A, and A' is its reflection in the vertical median, A'' the diametrally opposite cell, and A''' its reflection in the horiziontal median (so that the four cells are in direct quaternary symmetry), then the numbers on these four cells are: m, 65 − m, 16 + m, 49 − m, and the sum of these four numbers is 130. (3) The 16 cells of the two diagonals fall into four sets of four cells in direct quaternary symmetry, so the total of the two diagonals is always 520. (4) In every column two cells similarly situated with respect to the horizontal median sum either to 49 or to 81. Two pairs are 49 and two 81." 2, 5, 11, 14; 2, 7, 9, 14; 3, 6, 8, 11; 3, 6, 10, 13; 3, 6, 12, 15; 4, 7, 9, 12; 7, 10, 12, 15. The following six examples are from the "Knightly Peripatetics" in the Glasgow Weekly Herald 1873-4. The tours were set as problems, and the solution was published a week or two later, hence the two dates. Geometrical diagrams are omitted for the rest of this section but may be added at a later date if thought useful. VII April 12 - May 3, 1873 (diagonals 240, 280). IX May 24 - 31, 1873 (diagonals 256, 264). 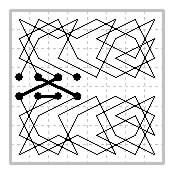 X June 14 - 21, 1873 (diagonals 288, 232). XIII Aug 16 - 30, 1873 (diagonals 288, 232). XVI Sept 20 - Oct 4, 1873 (diagonals 356, 164). XXIV Dec 20 1873 - Jan 3 1874 (diagonals 264, 256). According to H. J. R. Murray's account: "We find 15 tours, arithmetically different, which are [diagonally] magic squares. Twelve geometrical diagrams give 15 magic squares. The first three (ABC) are generated by paths without self-intersection [as also are G and H]. 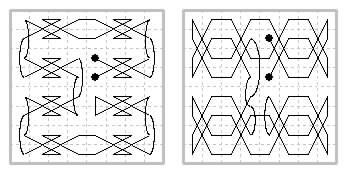 Tours D and E are formed from the same pattern of circuits, numbered from a different origin. Tour F has eight two-unit lines. Tours GH, IJ and KL are pairs with similar central patterns, and I is similar to C. The last three (MNO) are related in that the circuits used in M and N use the same cells, and the tour in O is formed by using one pair of circuits from M and the other pair from N; as a result the pattern of the circuits in this case shows only binary and not quaternary symmetry." At least five of these tours also appear in the Glasgow Weekly Herald articles by "E.H." on "Knightly Peripatetics". A is XII (July 19 - Aug 2 1873), G is XXV (Jan 10 - 24 1874), H is XXI (Oct 18 - Nov 1 1873), J is XXVI (Feb 7 - 21 1874), K is XXII (Nov 8 - 27 1873). There may be more in issues I've not seen. The tour M is quoted in Rouse Ball and Coxeter (1956) as by A. Rilly. These take the form of four knight paths, each of 15 moves, connected by four rook moves (or by three if the closure move connecting 1 to 64 is omitted). The results here are my own work. 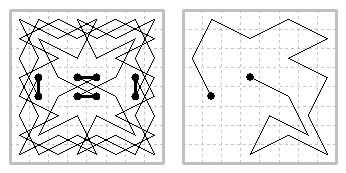 They were first published in The Games and Puzzles Journal #26 March-April 2003 together with the results on rectangles given in section 3 above. There is no proof that Beverley found his tour by this method. Another, equally possible method based on Contiguous Contraparallel Chains was described by H. J. R. Murray. Alternatively it may be that Beverley found his tour by some sort of search method, since his is the first of the regular tours to be encountered when they are arranged in sequence according to the Frénicle method for magic squares (i.e. oriented with the smallest number at the top left corner and the number to its right less than the number below it). The next diagram shows that the same plan as for the first 8×6 tour above works on the 8×8 board, the right-hand side being geometrically like the Beverley tour, but not arithmetically. The horizontal pairs all add to 65, and the vertical pairs to 97 and 33 which together equal 130. (The diagonal sums are DO = 360, DE = 288). The following is the text of an article I published in The Problemist July 1986 (p.196). A Unique Magic Tour. 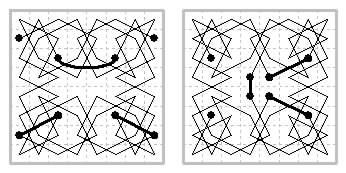 In 1882 the Abbé Jolivald (alias "Paul de Hijo") published an enumeration of all the ways of covering the chessboard with four 16-move knight paths in rotary or reflective symmetry. T. W. Marlow has recently (Chessics 24, p.92) corrected his count for the reflective case, finding 368 instead of 301. * If one move in the same relative position in each quarter is deleted the ends can be reconnected to form Empress or Emperor tours. For these imperial tours to be magic in ranks and files, when numbered from the start of a quarter, each quarter must occupy 2 squares in each rank (or 2 in each file). Of the 368 cases, only 30 fulfil this condition. Of the 61 Emperor tours derived from these 30 cases, only one also adds up to the magic constant (260) in the diagonals as well as the ranks and files. This unique case is illustrated. 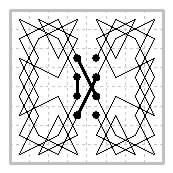 It happens that the curiously shaped 16-move knight circuit is one of the 7 that have no self-intersection. * Examination of the de Hijo work shows that all the paths were listed, but there was an error in the statement of the total.